This thread is for posting your Cooking, Science, and Other Miscellaneous Workshop Lessons and Ideas for the boy Jesus in the Temple. Luke, chapter 2, verses 41-52. Prepare a pitcher of ice water. Who recently had a birthday? Say: Today we will learn more about a story in the Bible when Jesus was a young boy at the age of 12. What do you suppose Jesus did for fun as a 12 year old? Do you suppose that Jesus had to learn things just like we do? Do you suppose that Jesus went to birthday parties and other celebrations? Say: It is interesting to think of Jesus as being close in age to you. Today we will be talking about a story where Jesus went to Jerusalem for the Passover celebration. We will be making the type of bread that Jesus would have eaten at a Passover celebration. Before we start our cooking project let’s have a time of prayer. Who can tell me about the celebration of Passover? Do you recall learning about how Moses and the Hebrew people marked their doorposts with the blood of a lamb? What happened to those people whose doorways were marked? Say: Passover was a time when the Hebrew people celebrated being “passed over” by the 10th plague on the Egyptians – the plague of the death. Their families were saved. Every year they remembered this occurrence and celebrated it in a festival called Passover. Say: Let’s go make some unleavened bread. While it is baking we will come back to talk more about our Bible story. Have everyone put on aprons, wash their hands, and gather around the metal table. The recipe at the end of the lesson makes 8-10 servings. Divide the class into teams and make two batches of bread. Make sure everyone has a role and gets a chance to knead. Show the students a loaf of bread made with yeast. Say: When God told the Israelites to get ready to leave Egypt, he told them not to put any yeast in their bread. Ask: Why God would not want them to use yeast? Say: If you use yeast it takes a lot of time, an extra hour or more, to make bread. God knew the Israelites would have to leave in a hurry. He wanted them to be ready to go. When the Israelites were allowed to leave Egypt it was an important day. God said, “remember this day forever”. Even now, 3000 years later, Jewish people still celebrate Passover. Bake the bread for 8-10 minutes. Place the Shepherd in charge of watching the bread. While the bread is baking, return to the Social Hall. Ask: What does the word “Gospel” mean? Say: The word gospel means “good news.” These first four books of the New Testament tell the story of the good news about Jesus’ life on earth and how Jesus died so that our sins are forgiven. Ask: What are the names of the first four books of the Bible? Have students find the story in Luke, chapter 2, verses 41-52. Early on in the Rotation, have kids take turns reading verses. 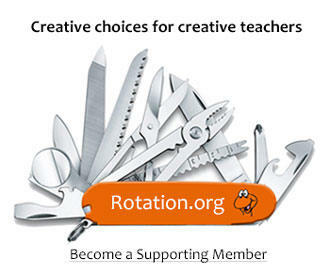 In later weeks of the Rotation, invite the students to share what they already know about the story. Fill in any missing details using their Bibles. Why do you suppose Jesus went to the Temple? Say: The Temple would have been not only a place to worship but also a place of learning. Learning took place by asking questions. Since it was Passover, all the important rabbis – the religious leaders of the time – would have been there. What questions do you suppose they talked about? Do you suppose they talked about the Messiah that was to come? Do you suppose that Jesus knew at that age that he was the Messiah? Say: We don’t know for sure what Jesus thought about his calling in life. From this story we do know that he considered it important that he spend time in what he called “his father’s house.” Perhaps it was his experience talking to the people in the Temple that helped him to see his purpose. It has been said that the original purpose of education for students in Jesus’ time was to teach kids to better understand their relationship with God. Ask: What about for you, do you suppose that learning and talking to people in our religious community can help you to better understand your relationship with God? Say: Jesus felt that he belonged at the Temple, learning about God and teaching others about God. The Bible tells us that after Jesus was found in the Temple, that he went home with his parents. Jesus was 12 in this story so he had lots of growing to do – both growing taller and wiser and in his knowledge about God. Our Bible key verse tells us this. Pass out the key verse bookmarks. Have everyone repeat the key Bible verse together. in spirit (example: by trying to pray every day or read their Bible). Practice the key Bible verse… Pick one student who will start off by saying the first word in the verse. Then go around the table having each student say one more word to the verse. If one of the students doesn’t know the next word, they have to start over with the first word. Have them try this once or twice with the bookmarks facing up. Then turn the bookmarks over so the verse is hidden. Butler, Trent C. Editor.. “Entry for FESTIVALS.” Holman Bible Dictionary. Mix flour, salt, and butter (best if melted) in a bowl. Mix oil and water into the bowl until it leaves the side of the bowl, and forms workable dough. If the dough is too crumbly, add a small amount of water (1/2 tbsp) until pliable. If the dough is too sticky, add a small amount of flour. Put a small amount of flour on the metal table and knead the dough lightly. Flatten the dough until it’s thin, about 1/8 of an inch thick. Pick it up, turn it over and roll out thin again. Perforate with a fork and place on a lightly greased (or parchment paper-covered) cookie sheet. For the curious: What does yeast do for bread? Yeast feeds on the starches in flour, producing carbon dioxide. The carbon dioxide expands the gluten proteins in the flour. The gluten proteins cause the dough (of which flour is a main ingredient) to expand and rise. Hulbert, Carol. 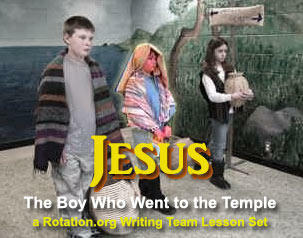 "Jesus as a Young Boy (in the Temple): Cooking Workshop." Jan. 2008. Place URL where lesson found inside angle brackets<>. It sounds sort of like a fruit cake. Or you could serve plain dates or figs. Jesus has "the Right Stuffing"
What is the boy Jesus "made of" ? What are the ingredients that make him want to celebrate, worship, learn and teach? Based on what we know about him, how he treated others, and what he did for us, what might his personality be like? Students will make a "CALZONE" (essentially a stuffed pizza turnover) using a wide variety of ingredients provided on a table. A tasty calzone is composed of three cheeses (ricotta, Parmesan, and mozzarella) mixed together with an egg, then additional ingredients can be added, the thin dough folded like a turnover and baked for 13-15 minutes. It can be brushed with garlic butter and dipped in sauce. After the study, the teacher places all the ingredients in front of the kids. BUT....sneaky, sneaky! In order to get each ingredient for their calzone, they must come up with a unique reflection about Jesus that starts with the FIRST LETTER of that ingredient or reflects something about Jesus or something from the story, or something the kids want to say about the story. (You choose how hard you want them to work for the ingredients). C, Cheese is for Celebrating the Passover, which is what Jesus was doing at the Temple. or C, Cheese is for Caring about God's Word by spending time with his teachers. M is for Mozarella, because Jesus' mom Mary missed him when he stayed behind. S, Sauce is for Search. His parents searched for him and when they found him, Jesus responded, see I'm in my father's house. B, "B" is for the Bread Dough --the Boy who at ate bread at that Passover, and became our Bread of Life. Other Ingredients provided that the kids can use IF they come up with a reflection for that ingredient. You do not have to make the "first letter" rule. You can tell them that they can have the ingredient if they can say how "Jesus is like (that ingredient." Or they can come up with a statement about Jesus that uses the ingredient's first letter or how that ingredient is "like" Jesus (spicy!) Feel free to give them hints, but don't give in too easily. Place all the ingredients in front of them, offer suggestions, and then have them write down on a sheet of paper their "reflections for ingredients." Spinach = Because Jesus was unafraid to Show his faith as a young boy. Or because Jesus' example makes us strong. Pepperoni, "P" because Jesus had two wonderful parents who dedicated him to God. Olive oil O is for only Son of God. Oregano Oregano is a spice. Jesus is not bland. "O" is for "O hey, where's Jesus?" Garlic Butter (brush on calzone before baking) G is for generous, good, God's House. Ricotta (this item is required of all calzones) Jesus what we need for our faith. Parmesan (to mix with the ricotta and egg) P is for parents, People in Temple, Priests. Egg (to mix into the ricotta and spoon onto the calzone pizza dough. Fold the Calzone dough = like hands in prayer to remind us that Jesus wanted to worship in the Temple. Bake the Calzone = Perhaps the Holy Spirit makes our faith come alive and feel like fire. Eat the Calzone = like we do in the Lord's Supper. Even share our calzones with each other, because we each bring something unique. A Calzone takes about 10 minutes to make and 15 minutes to bake. The thinner the faster, the wider the more you have to share. Work in teams of TWO. If a child doesn't like a certain ingredient, they can keep it off their half of the calzone. Fun ideas in Neil's Jesus has the "Right Stuff"ing lesson idea!!! Bread dough to make calzone: Jesus is the Bread of Life! Onions: slicing them makes us cry, but Jesus will wipe away our tears.